The Belfast Blitz is an enjoyable and interesting read despite being about a tragic and traumatic experience for the city’s residents. Belfast, unlike the cities of Southern Ireland, suffered heavily from bombing raids during the second world war. All the same, the shock of the April and May 1941 assaults on the city stemmed from the fact that they came MUCH later then they had elsewhere. London for instance had suffered heavy raids from September 1940 when the Luftwaffe shifted target from the RAF, it’s airfields, pilots and planes to the cities and industry of the British mainland. When they did come, the impact was intense and initially overwhelming. As Douds makes clear in his introduction, despite six months evidence from London and other victims of the German bombing onslaught of what bombing could do to a city, Belfast had ‘no fighter squadrons, ‘no balloon barrage and only 21 anti-aircraft guns when the war began’. 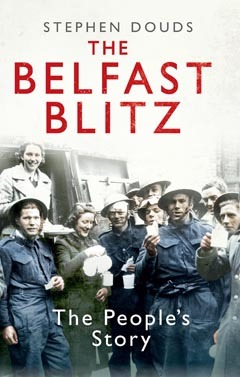 That the Belfast Blitz was shorter in duration then that experienced by other cities, didn’t reduce the trauma it caused and one of the strength of this book is that the author has chosen a fine cross-section of contributions. By including both military and civilian voices, official and domestic, young and old, Douds manages to bring alive the diversity of experience in the city during the raids. I’ve long been a fan of oral history and with this fascinating account of the impact of war on a city and its people, Stephen Douds has managed to deliver both interesting voices and a clear sense of the events. He has done Belfast a service and the granted his readers an insight into the pity of war. Written by: Eoinpurcell on 23 May, 2011.